Rating: 6.3/10. From 28 votes. Summary: The description, specs, photos, pricing and user ratings for the FNH FNP-45 Competition pistol, plus user ratings and comments. 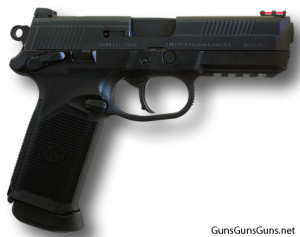 The FNH says its FNP-45 Competition makes the perfect major-caliber action pistol with its low-bore axis, reduced felt recoil and fiber-optic front sight. It offers a removable top plate for optics mounting and comes with three 15-round magazines and a black nylon case. a loaded chamber indicator on the external extractor. This entry was posted in .45 ACP, $1,001-$1,250, FNH, Full size, Semiauto on May 19, 2011 by Staff.